Hereditary Breast and Ovarian Cancer syndrome (HBOC) is a genetic condition associated with an increased risk of certain types of cancers. Individuals with this syndrome are more likely to develop breast and/or ovarian cancer and the cancers are also more likely to occur at a younger age than usual. Hereditary Breast and Ovarian Cancer syndrome has also been associated with an increased risk of other types of cancer; the types of cancer that are most likely to develop depend on the specific genetic changes that are present. What causes Hereditary Breast and Ovarian Cancer syndrome? Hereditary breast and ovarian cancer syndrome is a condition caused by an inherited genetic change called a mutation. Between 5 and 10% of breast cancer and up to 24% of ovarian cancers are believed to be hereditary. A gene is a hereditary unit of DNA that occupies a specific location on a chromosome. Genes carry directions to cells and tell them to make specific proteins that perform and regulate all body functions. Genes are capable of replicating themselves at each cell division. A mutation is a change in the usual DNA sequence of a particular gene. Mutations can be beneficial, harmful, or neutral. Many diseases, including cancer, begin in the genes. Genetic mutations can be inherited from a parent or can be random mutations that occur as a result of a mistake during cell division or in response to environmental factors. The two genes involved in the development of Hereditary Breast and Ovarian Cancer syndrome are BRCA1 and BRCA2. They stand for Breast Cancer Gene 1 and Breast Cancer Gene 2. When someone has inherited a mutation in their BRCA1 or BRCA2 genes it means that every single cell in their body has this gene mutation and that their body is not able to properly repair DNA. Put simply, there is a mistake in a gene that normally helps prevent cancer—which is why mutations in these genes are associated with a higher risk of some cancers. What are the chances of inheriting Hereditary Breast and Ovarian Cancer syndrome? There is a 50 percent chance that a person with Hereditary Breast and Ovarian Cancer syndrome will pass their mutation on to their children. Hereditary Breast and Ovarian Cancer syndrome does not skip generations, and male and female children have an equal chance of inheriting the mutation. This is called autosomal dominant inheritance. To read more about inheritance click here. Here’s how it works: Every person has two copies of the Hereditary Breast and Ovarian Cancer syndrome genes—one copy inherited from the mother and one copy inherited from the father. You need these genes to help repair DNA damage that occurs throughout ones lifetime. An inherited mutation in either of these copies will cause inherited breast and ovarian cancer syndrome. In other words, someone who has one normal gene and one mutated gene will have hereditary breast and ovarian cancer syndrome. When someone with this syndrome has a child, he/she may pass on the normal gene or the mutated gene—meaning that the child has a 50 percent chance of either a) inheriting the gene mutation, which means an increased likelihood for developing breast and/or ovarian cancer or b) inheriting the normal gene, which means an average risk for developing cancer (the same as the general population). Hereditary Breast and Ovarian Cancer syndrome is not a guarantee of developing cancer, but it does increase the risk. Breast Cancer: A woman with an inherited BRCA1 or BRCA2 mutation has a 50-85% chance of developing breast cancer by the age of 70, compared to a 12% risk in the average woman. For women who have had breast cancer, the chances of a second breast cancer either in the same or the opposite breast is 40-60%. Men with mutations in BRCA1 or BRCA2 have a 1-10% chance of developing male breast cancer. Ovarian cancer: A woman who has a mutation in BRCA1 has a 20-50% chance of developing ovarian cancer by the age of 70. The chances of developing ovarian cancer with a BRCA2 mutation are somewhat lower, between 10-30%, compared to a 1-2% risk of ovarian cancer in the general population. Cancers of the fallopian tube and peritoneum (lining of the abdominal cavity) are also seen more frequently in people with BRCA1 and BRCA2 mutations. There is some thought that most ovarian cancers may actually arise in the fallopian tubes and not the ovaries. Other cancers: While breast and ovarian cancers are the most common cancers in people with BRCA1 and BRCA2 mutations, these genetic changes may also predispose to other cancers. 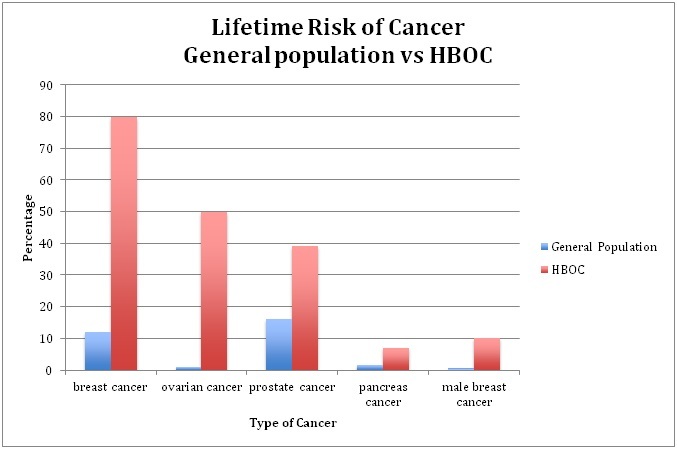 Men with BRCA1 and BRCA2 have been observed to develop prostate cancer at earlier ages than the average man. Other cancers seen, particularly in individuals with BRCA2 mutations, include a 1-7% lifetime chance to develop pancreatic cancer and melanoma. If you have questions and would like to speak to a genetic counselor about hereditary breast and ovarian cancer syndrome please either contact the Kintalk UCSF genetic counselors or you can find a cancer genetic counselor near you on the National Society of Genetic Counselors or the NCI Cancer Genetics Services Directory.